Bioproduction – FectoPRO | Tamar Laboratory Supplies LTD.
For the first time, achieve amazing protein yields using transient transfection and gene expression. FectoPRO™ Transfection kit is specifically designed for enhanced Transient Gene Expression (TGE) in suspension CHO and HEK-293 cells in various serum-free media, using low DNA amount (< 1 µg/ml of cell culture). FectoPRO™-mediated transfection process is easily scalable from a few ml to several liters of cell culture, ensuring robust reproducible protein production. Increased productivity and low DNA amount requirement make FectoPRO™ a cost-effective solution for bioproduction processes. FectoPRO™ largely outperforms other transfection reagents commonly used in Bioproduction processes in terms of transfection efficiency (Fig. 2), leading to superior protein production yields (Fig. 3). Fig. 1. 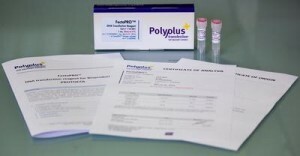 FectoPRO™ gives high transfection efficiency in suspension CHO cells. 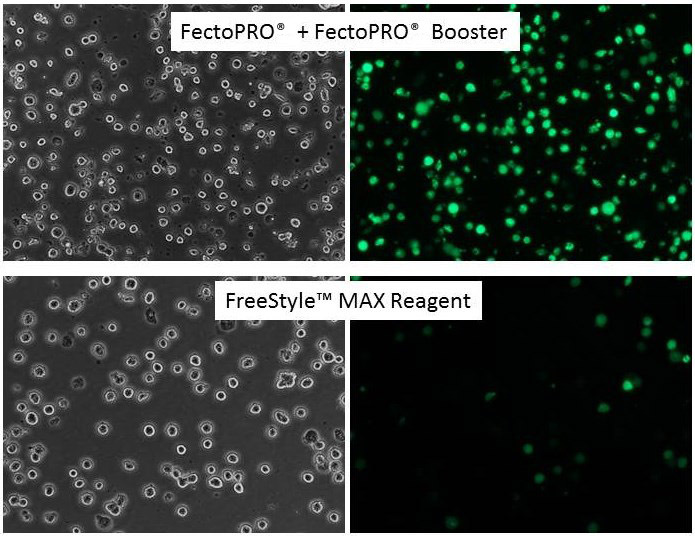 FreeStyle™ CHO-S cells were seeded at 1 x 106 cells/ml in 30 ml of FreeStyle™ CHO Expression Medium and transfected with FectoPRO™ + FectoPRO™ Booster or FreeStyle™ MAX Reagent using 0.4 µg/ml and 1.25 µg/ml of a GFP expressing plasmid, respectively. GFP expression was assayed 24 h after transfection using fluorescence microscopy.